In my review of The Sixth Sense (1999), I considered the notion that the films of M. Night Shyamalan tend to concern one overriding theme: a person (or persons) cut off from destiny. In films such as Signs (2002) the director also pursues that theme; that people lose hope when they aren’t working actively towards their purpose or fate. In Unbreakable, much as was the case in The Sixth Sense, Shyamalan crafts two main characters who are ensconced on that difficult journey. 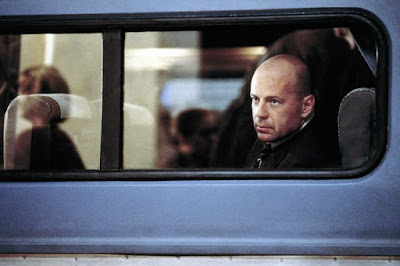 David Dunn (Bruce Willis) and Elijah Price (Samuel L. Jackson) function as mirrors of one another, yet they are joined by their individual searches for purpose. Who are they? How do they define themselves? The latter question involves the idea that we can pinpoint and comprehend our own self-image only in relation to others and society as a whole. David cannot learn who he is, until helped to do so by Price. In fact, he feels "sadness" everyday when he wakes up because he isn't who he is supposed to be. “Maybe you’re not doing what you’re supposed to be doing,” Elijah observes, before setting David on a path towards crime-fighting. Similarly, Price cannot achieve his somewhat grimmer destiny (as a villain or arch-nemesis) until Dunn realizes and fulfills his role as a superhero or protector. Thus there’s a powerful symbiosis between characters, no doubt. They can’t truly “be” what they are meant to "be" without the presence of the other one; without the influence of one another. At the same time that Unbreakable explores this theme of characters finding and achieving purpose in life, it follows up on Shyamalan’s other obsessive focus: the nature and importance of storytelling. In the case of The Sixth Sense, we were asked to consider story structure, and the manner in which stories must feature “twists and stuff” to keep them interesting for the audience. In Unbreakable, we are similarly asked, from the opening title card, to examine the significance -- both socially and culturally -- of comic-books. According to Unbreakable, comic books are not mere entertainment; they are modern hieroglyphs, in a sense, which inform us of crucial information about world. This idea is visualized by a scene in the Limited Edition shop wherein Elijah is positioned in front of literal hieroglyphs, ancient comic-books, as it were. It's not just that superheroes need to be themselves, according to the film, it's that the rest of us need heroes to look up to, or we lose hope. This is the role that superhero stories fulfill in our culture. Children like Joseph Dunn (Spenceter Treat Clark) need the optimism that only heroes offer; they need the stories that newspapers report on (as in the image above, accompanied by the headline "SAVED"). What kind of story is that? One in which people are rescued, not lost. One in which crime doesn't pay, and criminals don't win. That idea of comic-book storytelling ties in with the Elijah/Dunn relationship. The shattering ending of the film is telegraphed when Elijah’s mother notes early on, of a comic book, that “They say this one has a surprise ending." In this case, that surprise is a reflection of something we absolutely accept as inevitable in comics (yet somehow don't see as inevitable in the film): Every great hero has a great nemesis. Batman has the Joker. Superman has Lex Luthor. Spider-Man as Green Goblin, and so on. I made you. You made me. We are opposite sides of the same coin. Or as Elijah puts it, "We are on the same curve; just opposite ends." In my book, The Encyclopedia of Superheroes on Film and Television, I ranked Unbreakable among the top ten titles of the genre (at number 6, actually), and I stand firmly by that assessment. Unbreakable is a magnificent -- and rare -- superhero film because it isn’t really overly concerned with crime, or evil plans to control the world. Nor is concerned with gadgets or huge action scenes and special visual effects. On the contrary, Unbreakable concerns the heart of a superhero whose destiny has been blocked. Shymalan’s film examines the idea that David Dunn has lost hope because he can’t do what he was meant to do; protect us all. Similarly, it suggests that somebody on the same journey can become an evil monster, not merely lost or isolated, if he can’t understand his place. And yet for Elijah we still have sympathy. Unlike so many villains in the genre (who are evil for the sake of villainy and nothing else), we see why he is in pain; why he is driven to discover his purpose. He is so terribly wounded. Without a purpose, Elijah has been made, simply, to suffer. So he must know his purpose. There is no option for him. Too many superhero films (from Marvel and D.C. among others) focus entirely on vengeance as a motivator for so-called “heroism.” Batman, Daredevil, the Crow, and other super heroes are often motivated by their need to “get back” at someone for the pain in their lives. These films and these individuals routinely mistake revenge for justice. Unbreakable eschews this terrible idea -- that hate can create heroes -- and suggests instead that heroism, and in particular, super-heroism, is really about the drive to protect and care for others. David becomes great not by hurting others, or by returning hurt for hurt. He becomes great by acknowledging his ability and his deep-seated need to save the innocent. Oppositely, Elijah, hurts others so that he can understand his pain, and as a comic-book aficionado he understands exactly what that makes him: a super-villain. Unbreakable thus restores a real sense of morality to the often wayward superhero genre, which consistently portrays angst, anger and violence as the skill set of great heroes. Superheroes? I don’t like them when they’re angry. A campus security guard living and working in Philadelphia, David Dunn (Bruce Willis), is estranged from his wife, Audrey (Robin Wright Penn). After David miraculously survives intact a terrible train wreck that kills 131 other people, he stops to re-examine his life, and indeed, his relationship with his family. Spurred on by a stranger who owns an art gallery and is a comic book aficionado, Elijah Price (Samuel L. Jackson), David begins to examine his past, and the decisions he has made about it. Were those choices taking him closer to his destiny, or further from it? Has he been hiding for years from the truth about his nature? Elijah believes that David has been hiding. He also believes that comic books are a form of history, and that people like David may be protectors, guardians or even superheroes. Having suffered from a rare bone disease called Osteogenesis Imperfecta his whole life, Elijah believes that his life too must have a purpose too. He helps David find his place in the world, so that he may be sure, finally, of his place as well. David Dunn is a lonely man. That is the visual message that is conveyed almost immediately in Unbreakable. He is isolated from others, including his wife, not only because he is so different from them (having never been sick), but because he is hiding from his real purpose; from his real identity. In film’s first scene, Shyamalan finds an intriguing technique to reveal Dunn’s isolation. We view David sitting on a train in motion, from the vantage point of the seats in front of him. Or more accurately, from the “crack” or gap between two seats ahead of him. As David attempts to hit on an attractive young woman, the camera moves left and right as each person talks; showing us David and then the target of his affections, and then David again. But here’s the thing: the two characters are not on screen together for any duration. David is always seen alone, even while he is attempting to connect to another person. He can’t connect, the visuals imply, because he is denying his real self. He can’t begin to reach out to others until he “sees” who he really is. This composition probably sounds like a little thing -- the position of the camera in a simple dialogue scene -- but without a lot of showiness, Shyamalan has pinpointed the perfect composition to express David’s isolation. Even when he is trying to reach out, he is alone. And he will continue be, until he faces the truth about himself. Elijah is more obviously differentiated from others. His terrible physical condition trapped him indoors when he is young. His condition also gives him a limp in adulthood, and other physical differentiation from other people. But in a very real way, David is just as isolated, even though he is at the opposite end of the spectrum. Even though David never gets sick or hurt, and Elijah always gets hurt, they are the same, in a sense. Joined by their distance from normality. Shyamalan explores the superhero milieu in some intriguing visual fashion in the film. He gives David Dunn a name of notable alliteration, for example, like Clark Kent, Peter Parker, or Bruce Banner. 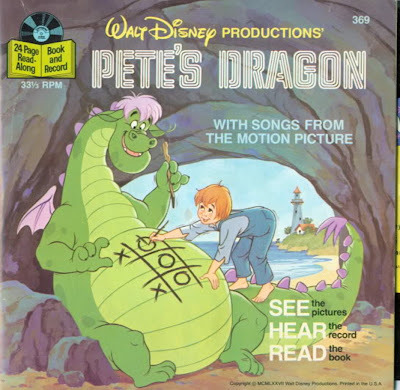 Similarly the director associates his characters with individual color schemes. David’s world is all olive-green. His uniform is an olive-green poncho (a cape and cowl?) and by contrast, Elijah’s world is all purple and flamboyant in coloring, a reflection of the first occasion upon which he saw a comic-book. His mother wrapped up the issue in a purple package, and it changed his life. In almost all superhero stories, heroes and villains are similarly color-coded. We associate red, yellow and blue with Superman, for example. 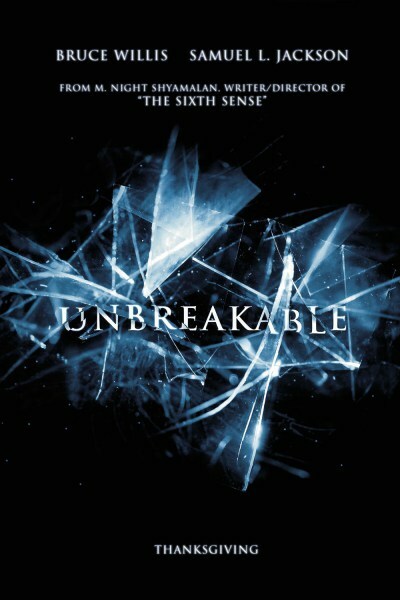 Although Shymalan tones down the brightness a bit in Unbreakable, he accomplishes the same goal. He gives his superhero and super-villain a consistent color scheme, even if it isn’t noticeable immediately. This idea adds immeasurably to the concept of the film as a superhero origin story. Also, Shymalan provides one or two variations of what I call "the Gargoyle Pose." Superhero films are rife with this pose. A superhero stands alone on a building, or silhouetted in front of a tall building or other notable landscape. The shot tells us that he is watching the world for us; but also that he is physically separated from the rest of us. The film goes further into superhero tropes, charting water as David’s equivalent of Kryptonite, and tagging his particular power, which I would call Psychometry. Specifically, David can discern knowledge of people and events simply by touching them. Importantly, Elijah and David don’t touch until Elijah wants him too; when he has determined his “place” in relation to David. That final touch represents the “surprise ending” of the film but also, ironically, the start of the real story. David and Elijah's first "touch" -- shaking hands, essentially -- is also their last. Their friendship will never be the same after that touch. 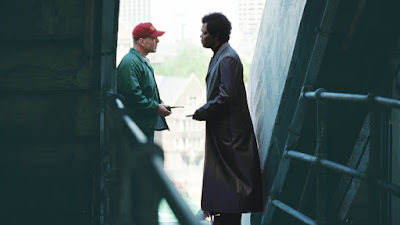 In essence, Unbreakable is an origin story, revealing how two men have come to know each other as friends before a lifetime of (presumed) animosity). The next story in sequence s about how the two men -- on opposite sides of the law -- will clash for supremacy and dominance. I’d love to see Shyamalan, Willis and Jackson return for an Unbreakable 2 that charts that particular story, the traditional superhero story. Unbreakable is veritably brimming with visual and narrative ingenuity, and there are few cheats in the film that take away from the new perspective that the denouement provides. Instead, Unbreakable packs an emotional wallop because at the same type we feel such happiness for David that he is finally pursuing his rightful destiny, we feel utter sadness for Elijah. We have seen that Elijah is loved dearly by his mother and that she has done everything in her power to make him strong and powerful. But we also see that Elijah has been twisted by his sickness; twisted by his obsession to understand who he is; by his demand for "answers." The film’s ending works so powerfully because we love Elijah at this point, and even though he is “evil” in a very real sense, we love him no less. Very few superhero movie villains are handled with such depth and indeed, sympathy, in the modern canon. So does Unbreakable actually feature a twist ending at all? As I’ve written before, Shyamalan is universally judged on the basis of his twist endings. Either they work or don’t. He can't seem to win on that front. Few critics stop to consider, however, whether these finales were intended to be viewed as a “twist.” We certainly know from the telegraphing about a comic-book with "a surprise ending" that Shyamalan intended to shock the audience in this case. Yet, much like The Sixth Sense, there are clues all along in Unbreakable -- those bread crumbs I like to write about -- that prepare us for the final revelation. In this case, David and Elijah, our two main leads, are both associated with comic books, and both differentiated in terms of their fashion/color. Those are significant bread crumbs to consider. Furthermore, Elijah’s Mom discusses with David the difference between a soldier villain (a brute, essentially) and an arch-enemy type nemesis (like Elijah), again preparing us for the dropping of the other shoe. 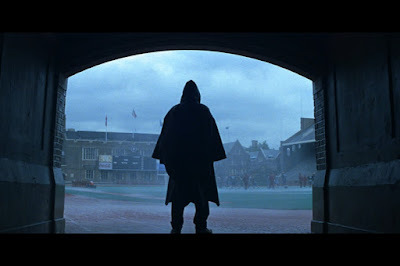 For me, the ending of Unbreakable isn’t about a “twist” so much as it is -- as is the case in all Shyamalan’s films -- about seeing and synthesizing, admittedly with new information, all the data we have previously made (incorrect) assumptions about. I will say this, the end of Unbreakable doesn’t feel cheap, manipulative or gimmick to me. It feels, instead, like destiny attained, and I believe that, in a nut-shell, is what the film is all about. David has reached his apotheosis, and in doing so, has given Elijah his. A real “twist” would come out of left field, and I would argue that there could be no other ending to Unbreakable, even if we can’t always see this one coming. At the time of its release, some critics (like Maclean’s Shanda Deziel) suggested that the film was unable to “escape its shadow” (The Sixth Sense), but again, I disagree. 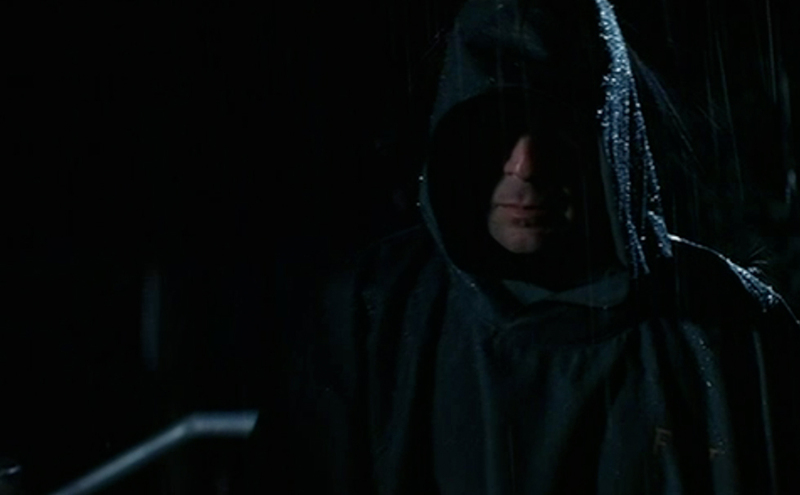 It's true: Unbreakable brings back Bruce Willis, and repeats Shyamalan’s signature obsessions. Specifically, the film functions with two characters acting as inverted reflections seeking their destinies. At the same time, it can be considered a deconstruction of the essential qualities of story-telling. But this film chooses a different genre (superheroes rather than horror) to explore these fascinations. Assessing Unbreakable as a mere shadow of The Sixth Sense is, to me, like saying that Casino (1995) is a repeat of Good Fellas (1990). I mean, they’re both gangster movies, right? On the contrary, they are variations on a theme, and examples of a director creating a consistent canon; one in which the same ideas are investigated but from different angles, or in a different way. Unbreakable is a great film, and it suggests, perhaps, that in the the first decade of the twenty-first century M. Night Shyamalan was something akin to a franchise unto himself. His movies represent a series of meditations on similar themes, but with different specifics and outcomes. Each movie offers new characters and new genre ideas, but we keep going back to the concept of destiny interrupted, and a study of the ways that movies reflect storytelling tropes.